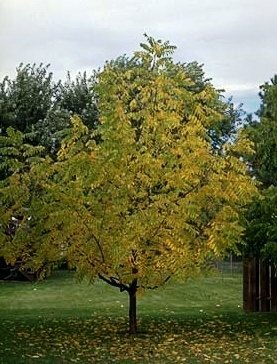 BLACK WALNUT - a medium to large, spreading, roundheaded tree which may reach 50-60 feet in height on favorable sites. Prefers a moist, well-drained soil. The fruit is a hard shelled nut. It is native to the eastern and central United States. Winter hardiness when young is a problem in the Northern Plains.